Just when you thought summer was coming to an end, Idaho is just starting to become a great riding location. Plagued by heat and fires from June through August, temps cool into the 70's and 80's by mid September and the fire season is on its way out. That makes it a perfect time for adventure tours in Idaho. Above: The Historic Lolo Trail is one of several off-pavement rides that will be offered during the rally. The staff at Boise's Happy Trails knows their way around these parts like nobody's business, and they've selected the Lewis & Clark resort in Kamiah (kam-ee-eye), Idaho as the destination for their summer rally. The rally dates this year are September 7th - 9th. Included in the cost of admission, rally attendees will be provided a commemorative rally T, dinner on Friday and Saturday night and GPX tracks for all the suggested routes. In addition, attendees will have access to the evening slide shows held Friday and Saturday evenings. Admission is just $75 per rider. The event location is central to a number of historical rides, like the Lolo Motorway and the Elk City Wagon Road, both of which will appeal to intermediate and advanced riders. If you've already ridden these two rides before, you might enjoy the Fire Lookouts ride, or the Bridge Tour ride around Dworshak Reservoir. Both routes were designed especially for the event by employees of Happy Trails. 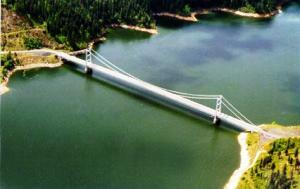 Photo: The Bridge ride includes a blast across the Dent bridge. Adventure riders new to off-roading will enjoy exploring the many paved/gravel road combinations across the Nez Perce Reservation to the west of the rally site. As with all the suggested rides, a special Nez Perce Explorer Route GPX track will be available for download when you arrive. Sound RIDER! will lead a special educational ride along this route Saturday at 9 am for those wishing to work on techniques for both on and off pavement riding. The Lewis & Clark resort offers rally goers a choice of motel rooms, cabins, RV or tent spaces (with electricity), allowing attendees to all gather in one place. You must contact the resort directly to book your accommodation preference (a separate cost applies). Attendees who would like to arrive sooner than Friday are encouraged to do so, that they may check-in at registration when it opens bright and early Friday morning at 8 a.m. 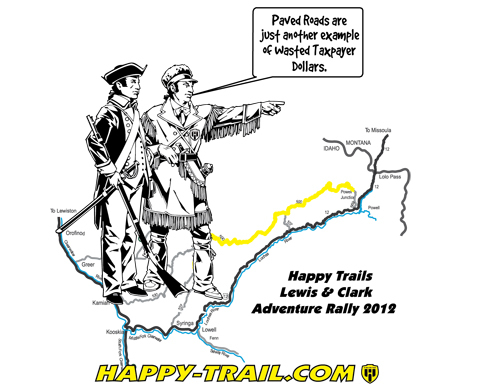 Happy Trails is no stranger to running rallies. Over the years they have been at the forefront of rallies put on for KTM, KLR and V-Strom enthusiasts. They also play an active role in supporting the Dualsport Northwest Rally every summer in the Columbia River Gorge. If you think rally season is over, think again. It's just getting started in Idaho!